Counting by 7s by Holly Goldberg Sloan. Grades 5-8. Dial, August 2013. 384 pages. Reviewed from ARC provided by publisher. Willow Chance is an outsider. She thinks deeply and values logic and order. She's so smart that school is boring to her, and when Willow gets a perfect score on a standardized test, she's sent to counseling because her principal is convinced that she cheated. When tragedy strikes and Willow's parents are killed in a car accident, Willow has no one to turn to. She's forced to depend on the kindness of relative strangers. But for her new unlikely friends, Willow is the catalyst to great and wonderful changes in their lives. Simply put, this is a story I didn't want to put down. It's a story about the power of connection. It's a story about lost people finding their ways home. It's a story about creating something from pretty much nothing. And it's a story that shows that family comes in all different shapes and sizes, not necessarily the people you're related to by blood. The story is mainly told from Willow's perspective in the first person, but we also get third-person chapters from some of the other characters. This style was used to great effect, as the reader's able to really see how all the characters begin to come together and how they begin to change and grow. Willow is an outsider, a girl possibly somewhere on the autism/Asperger's spectrum (although that is never stated). It's her very oddness that brings her into this story and it's her oddness that begins touching the characters she meets. There's a growing trend in middle-grade literature to depict kids on the autism spectrum, but Willow's story truly never would have happened if she was a neurotypical girl. Family is a huge theme throughout the book, even from the beginning. Willow is adopted, with no knowledge of who her biological family might be. After the accident, Willow feels like she's lost her family twice - her biological family and her adoptive family. What's left? What does a real family look like? This is a question that Holly Goldberg Sloan tackles with grace. It turns out that family doesn't have to be your blood relatives. Family is something that can be created out of nothing. There are a few items in the story for which I had to suspend my disbelief, but it was such a magical story that I didn't mind. And by the time I got near the end, I couldn't put the book down because I just had to see how everything would play out. Holly Goldberg Sloan's debut novel I'll Be There was one of my favorite books of 2011. Counting by 7s is a great follow-up and definitely did not disappoint. Willow made me think of Emma Jean Lazarus, although the tone of Willow's story is a bit more serious. If you love the character of Willow, try Emma Jean Lazarus Fell Out of a Tree by Lauren Tarshis. Emma Jean Lazarus is another character possibly somewhere on the spectrum who is trying to navigate middle school. If the serious subject matter and an atypical character dealing with grief are appeal factors, try Mockingbird by Kathryn Erskine. In Mockingbird, Caitlin (definitely on the autism spectrum) deals with the death of her older brother, a victim of a school shooting. The story is told with poignancy and humor, similar to Counting by 7s. If you like stories about all kinds of unrelated characters coming together and seeing how their stories fit, try Greetings from Nowhere by Barbara O'Connor. In this book, four kids meet at the Sleepy Time Motel in the Smokey Mountains, each looking for something. 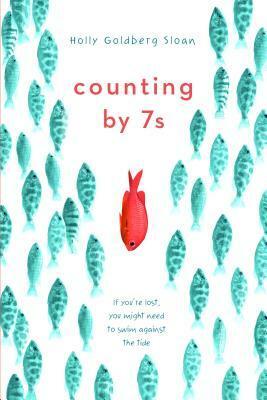 Counting by 7s will be on shelves August 29.